There have been calls on the Irish government to investigate the work the late great Jimmy Savile did with the Central Remedial Clinic in Dublin. The tracksuited one was a regular visitor to the Dublin clinic and spearheaded many fundraising events for the facility. 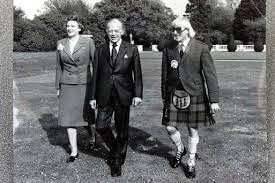 Here is Jimmy with then President of Ireland, Erskine Childers, and Lady Valerie Goulding. Jimmy is the one in the kilt. Over the past couple of years Jimmy Savile has been much maligned. The BBC have cut his jib from all episodes of Top of The Pops 2, and other music nostalgia programmes, which must have taken many, many hours of editing; and, as well as being a disgraceful waste of licence payers money, is, in my view, approaching the issue the wrong way altogether. If I had my way, which is I admit unlikely ever to happen, in the aftermath of Jeremy Paxman I'd appoint as the new presenter of Newsnight, the corpse of Jimmy Savile. The BBC should just lie back and think of the viewing figures. But of course they haven't got the guts. Political correctness gone mad, and all that. Earlier this year, as a special tribute to Jimmy, I re-wrote the lyrics of Elton John and Bernie Taupin's Candle In The Wind. The two previous versions of the song were addressed to Marilyn Monroe and Princess Diana respectively. Mine is addressed to Jimmy. You can read it here. Meanwhile here's what Tuam's finest, Mr John Lydon, had to say about Jimmy in a 1978 interview which the BBC did not broadcast.